Today the Financial Times has reported that a group of vulture funds have hired lawyer Lee Buchheit to argue for debt relief for Sudan. They hope that if the North African country gets debt relief from governments and multilateral institutions through the Heavily Indebted Poor Countries initiative, it will enable the vulture funds to get a return on their debt. Much of Sudan’s current debt came from loans in the 1970s and early 1980s when the government was supported by western countries during the Cold War. In 1984 following a set of economic shocks, including a huge drought, Sudan defaulted on the debt to western governments and multilateral institutions, as well as private companies. Since then, interest has been added to these loans every year, making them grow massively. The debt to the private sector has grown from $1.6 billion to $8 billion. Western governments have been charging 10-12% interest every year, making the debt owed to them grow from $4 billion to $19 billion. Sudan has been trying for several years to enter the Heavily Indebted Poor Countries debt relief initiative. If it did it could get much of the debt owed to western governments cancelled. The vulture funds who own the private debt would then press to get hundreds of millions back on their debt. The Financial Times has reported the vulture funds could “take as much as a 90 per cent write down” on their claims. However, this would be from $8 billion to $800 million, so only a 50% write down on the original $1.6 billion that was owed. Moreover, the vulture funds probably paid only a few cents on the dollar when they bought the debt, so a 90% write down on the total claimed could still mean huge profits. 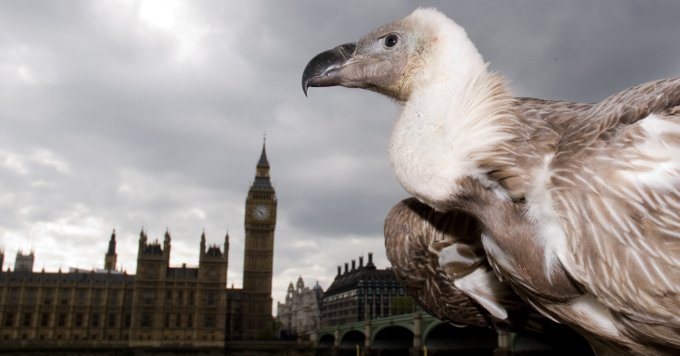 In 2010 the UK parliament passed a law which prevents vulture funds suing governments for more than they would have got if they had taken part in the Heavily Indebted Poor Countries debt relief initiative. If the debt is owed under UK law, this probably limits the vulture funds to claiming a maximum of 10% of the debt anyway, so the 90% write down is not out of generosity but enforced by law. The Western governments are also set to make large amounts if the debt is cancelled. Most of the debt, $15 billion of the $19 billion, is made-up money based on fictitious interest rates. However, when they cancel such debt, Western governments count it as ‘aid’. This allows them to count the cancellation as contributing to their aid targets, without spending any money. In the UK’s case, this would allow it to cut aid by $1 billion. For western governments as a whole, $19 billion is 15% of annual development assistance. So vulture funds and governments are looking to make money out of debt relief for Sudan. What does Sudan get out of it? Because it is not paying the debt, the main benefit is gaining access to new loans. Therefore, for the Sudanese people the key question is how those loans will be spent. In other similar situations, such as Zimbabwe, local campaigners have called for a public debt audit to discover what the loans were originally spent on, exposing any illegitimate borrowing and lending, in order to create a system to ensure any future loans are well used. Rather than rushing a debt relief process to make money, creditors would be better to ensure a proper investigation of the debt as a way to prevent debt crises from being repeated.